Nestled off of Mill Ave. in Tempe is one of Tempe’s best kept secrets. Delice Bistro is a European style bakery that celebrates Europe’s slow food movement. They serve baked goods such as croissants, as well as sandwiches, quiches and the like. They even have an on-site chocolatier. While researching for Tempe’s Brunch Crawl, we stopped in to try a couple of their croissants. The feel of Delice Bistro is how you’d imagine a European cafe to be. It is very calm and perfect for a casual lunch date or even an evening dessert date (on Friday and Saturday they are open until Midnight!). We stopped in after eating breakfast at Caffe Boa and walking down Mill. We ordered Iced Americanos and at the suggestion of the guy working at the counter, we ordered an Almond Croissant and a Cheese Croissant. We had heard that the croissants at Delice Bistro were good, but nothing prepared us for the taste of heaven we were about to experience. Now if you’ve had a croissant, even the sub-par ones are pretty good. However, when you find a good one, it is like seeing the world in a whole new light. 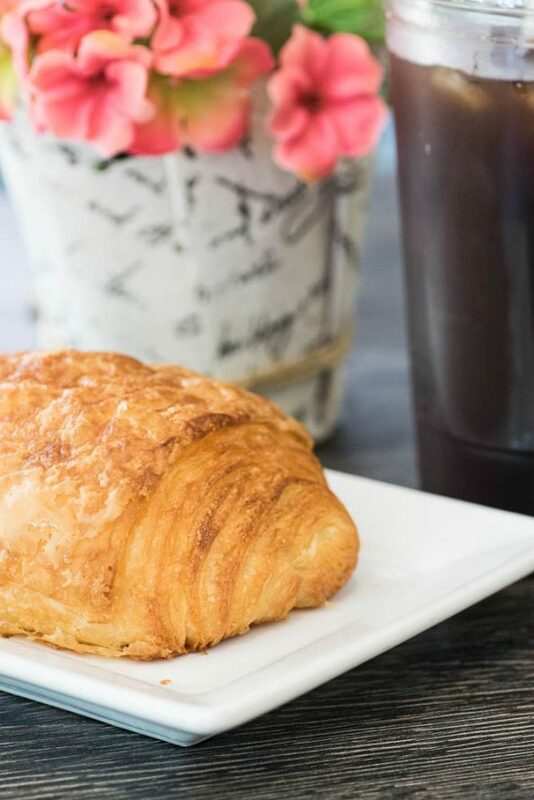 The choice of the Almond Croissant and Cheese Croissant was perfect because it gave us a savory and a sweet. Both have that perfectly flakiness that you desire in a croissant. Crusty on the outside and soft and buttery on the inside. 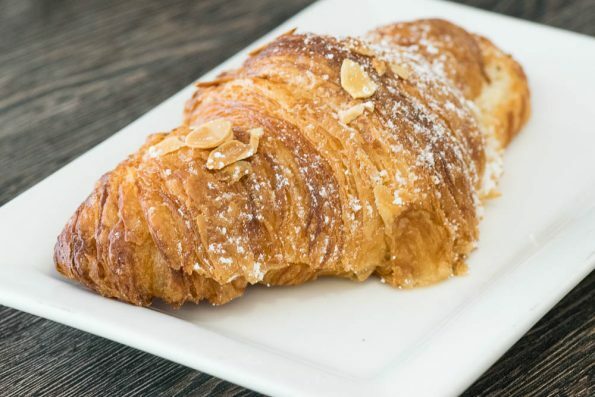 The Almond Croissant has an almond paste in the middle making it sweet but not too sweet. The Cheese Croissant had Gruyere cheese in the center and when it is served warm is to die for! With everything baked fresh daily, it is hard not to see why Delice Bistro totally has it going on! We can’t wait to go back and dive deeper into their menu! Quiche anyone? What is your favorite Tempe spot to dine? We always say that we don’t eat in Tempe enough so we are dying to know! Leave a comment below or use the hash tag #GeekEats!